At Classic Unimogs we sell you "a lot of mog for the money". To our customers, we are simply Ziggy and Lisa. We are a small shop with low overhead, and pass the savings on to you. We are located in the south-west of Germany, in the small Bundestaat, the Saarland. 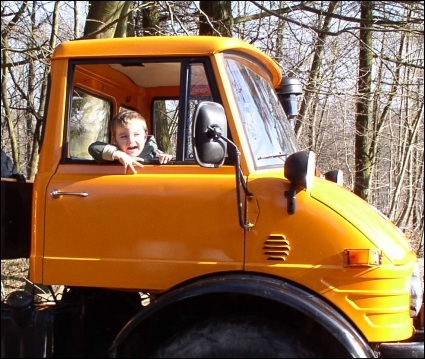 We know the Unimog and 4x4 business and can find quality vehicles at good prices. We service and detail our vehicles extensively before shipping, and provide our customers with support and information. We also try to educate and entertain all of our Web site visitors about the classic Unimogs, Volvos, Wolf, Iltis and other off-road vehicles. So if you have done a comprehensive company search on where to find the best place to purchase a classic Mercedes Benz Unimog, then we are happy you have come to visit our company website. Over the past few years our company has sold and shipped numerous vehicles to customers in Europe, the USA, and Canada. We don't keep a lot of vehicles in stock. Rather we specialize in Unimogs with exceptional features like double cabs, agra models, winches and crawler gears. We also stock Swedish ex-military Volvos like the C303 (TGB 11 and TGB 13). We are always searching for interesting, quality 4x4 and off-road products that we think will please our customers. Click on a name below to send the person an e-mail. Glenn James - England I want to let you know how impressed we are with the condition of our DoKa. The truck is in much better shape than I would have imagined. Thank you for supplying such a great truck. - Alan, Unimog 416 DoKa. Picking up the Unimog in Tacoma was no problem at all. The mog started right up and the drive home was fine. I am happy with the mog and I am looking forward to some good times in the mountains with it. Thank you guys so much. - Steve, Unimog 404. I get at least an email a week asking where to find a Unimog just like mine. I always refer them to you. - Matt, Unimog 406 DoKa. Thanks for your hospitality. You made us feel very welcome. It ran like a dream all the way home - Glenn, Unimog 406 w/ Hiab Crane. Click here for TESTIMONIALS ! Read what our customers have to say. March 2003 - Brandon is into the big boy toys! 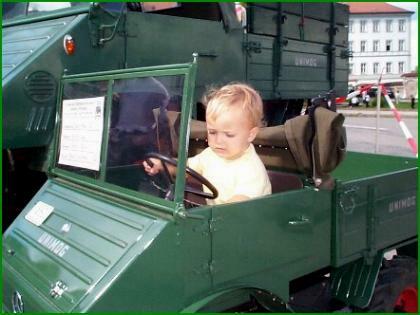 at Gaggenau, and at another Unimog Treffen in Bayern - July 2001.